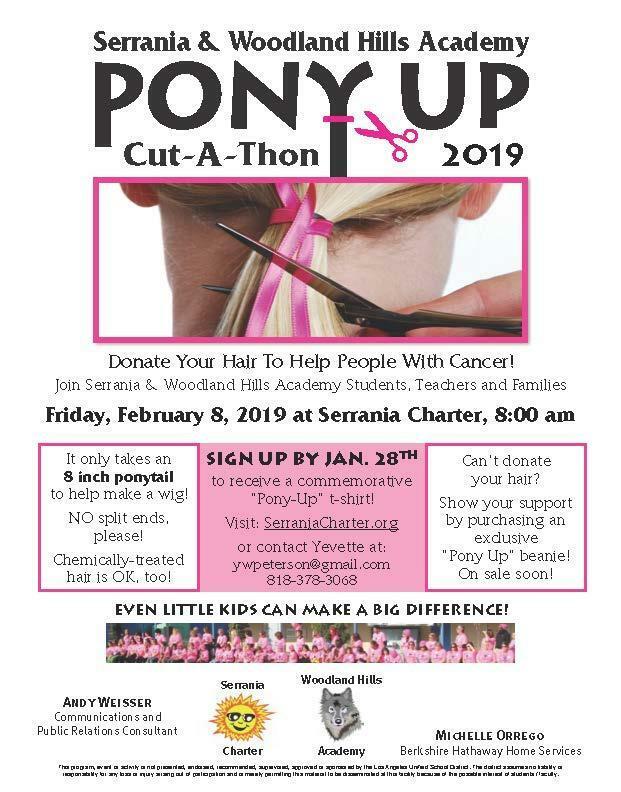 It's that time of year again.... time to start measuring ponytails, sharpening sheers, and getting ready for the Pony Up Cut-A-Thon with Woodland Hills Academy and Serrania Elementary on Friday, February 8th! Donating hair so it can be made into a wig for someone battling cancer is such a powerful way to show your support, offer help, and give someone TRUE KINDNESS and HOPE when they need it most! Any WHA community members can participate - students, staff, parents, siblings, family, etc! Ponytail donors will be paired up with a professional hair stylists who are donating their time to cut the ponytails and provide a "clean up" cut and a blow dry at the event. Bright pink "Pony Up" Beanies will go on sale for $5 in the coming weeks - this is a great way for the WHA to join together and show our support even if you can't donate a ponytail! Please see the attached flier for further details... If you have any questions, please contact Yevette Peterson at ywpeterson@gmail.com. LET'S PONY UP, WOODLAND HILLS ACADEMY!